A novel-in-verse about how one teen boy survives the March 2011 tsunami that devastates his coastal Japanese village. On that fateful day, Kai loses nearly everyone and everything he cares about in the storm. When he’s offered a trip to New York to meet kids whose lives were changed by 9/11, Kai realizes he also has a chance to look for his estranged American father. Visiting Ground Zero on its tenth anniversary, Kai learns that the only way to make something good come out of the disaster back home is to return there and help rebuild his town. Today we welcome Leza for an interview! I started writing seriously in junior high, when I had a fantastic creative writing teacher in the 7th grade who inspired us to keep a journal, read as much as possible, and write. In class, she played classical music and gave us graham crackers while we did our writing exercises. It was always my favorite class. So, I dreamed of being a writer but didn’t know if it was actually possible. I knew how much work it took and what a hard road it was and that many talented people gave up on their dreams. I decided to never give up. Even if I couldn’t make a living at it, I’d still do it. So I had lots of odd jobs to pay the bills while I wrote. I think our themes choose us. As an American living abroad in Japan, I’m interested in ideas of identity and history. How is culture shaped, and how are we shaped by it? All of my books deal with notions of finding home. "Up from the Sea," my debut Young Adult novel in verse about the March 11, 2011 Japan tsunami, is about making a home within yourself when the only home you've ever known is destroyed. My memoir, "Here Comes The Sun" charts my quest for motherhood across two decades, two continents, and two thousand yoga poses. Its about creating connection and family--finding a home in each other, and in the world. "Jet Black and the Ninja Wind," a YA adventure I co-wrote with my Japanese husband, is about a biracial girl seeking home across cultures. Her mission is to save her ancestral home and its ancient treasure. Then there's the poetry. "Yoga Poems: Lines to Unfold By" deals with finding a home in one’s body. "Yoga Heart: Lines on the Six Perfections" charts the path to finding a home in the spirit. It’s a subject that fascinates me. One of the other things I do is teach yoga, and run a yoga studio. Yoga helps me to stay centered and balanced, and to keep things in perspective. It’s also taught me a lot about discipline, perseverance, and about honoring the process. The main thing I learned in yoga is that it’s okay to fail--there are so many yoga poses I cannot do. Failing is how we grow, evolve, find our limits and explore surpassing them. I love the phrase “failing forward,” which embodies this idea. Writing is very solitary and internal--in the mind. Yoga is very physical, in the body and breath, and yoga classes are about community. So I’ve found that yoga and writing are a great balance. Just about everything! For me, the hardest thing is just seeing a book through to the end. Finishing. It’s so hard not to get discouraged by the bad days, the obstacles, the times when the plot is not working or your writing is just not what you want it to be, what you hope it could be. But if you force yourself to sit back down in your chair and write through it, you’ll usually find a way out. Patience and perseverance are the keys. I’ve published twenty books in a variety of genres--poetry, fiction, non-fiction, translation. Some I’ve edited, some I’ve co-translated from Japanese, some I’ve co-written with my husband, and some I’ve written entirely myself. It’s so hard to pick a favorite because each one is so unique. 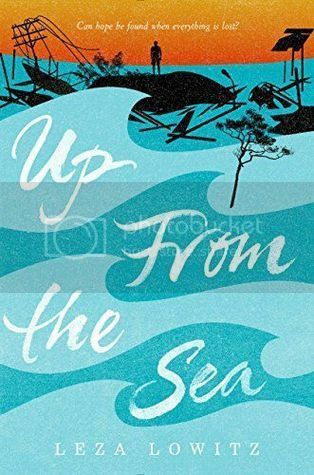 But if I had to, I’d say that Up from the Sea, my new verse novel about a half-Japanese teenaged boy caught up in the 3-11-11 tsunami, is my favorite. I feel very emotionally invested in Kai and the people of his town, which are based on people I met in the disaster zone. Five years later, they still need our support. I’m rooting for their recovery, and I’m inspired by real-life stories of people coming to help others, even across vast oceans. At my kitchen table. And with my two writing partners at a Tokyo Starbucks. We meet two times a week to do timed writings to keep each other on schedule. It’s the best way to work! I’m writing another YA novel about an ordinary boy with extraordinary powers and the girl who saves him from himself. When that’s done, I plan to write a YA love story set during the second world war--a true tale of extraordinary courage and passion. At the same time, my husband and I are working on books two and three of the Jet Black & The Ninja Wind trilogy, so stay tuned for more awesome ninja girl adventures. Thanks for being here today, Leza. It was great having you with us! 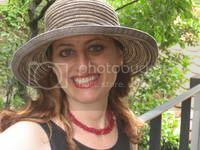 Leza Lowitz is a California girl who lives in Tokyo. Always willing to go to any length and travel any distance to discover who she was and how to be happy, she met her soulmate at a jazz club in Yokohama, and moved to Japan to be with him. Ten years later, Leza and Shogo undertook the crazy project of opening a yoga studio in Tokyo. Three years after that, they adopted a beautiful boy and rescued two dogs, starting a family in their mid-forties. Leza and Shogo often write together, and only occasionally drive each other crazy. Building a bridge from East to West, they’ve collaborated on a book about kanji, a collection of poetry by a pacifist Japanese soldier, and a trilogy about a young female ninja. Other couples finish each other’s sentences. They finish each other’s books. From an early age Leza dreamed of being Bruce Lee or Joan Didion. She’s still working on that combination. For over two decades, she’s been bringing together the worlds of writing and spirituality, charting her quest in over seventeen books and in the New York Times online, Yoga Journal, Shambhala Sun, The Best Buddhist Writing 2011, The Huffington Post, The Japan Times, and The San Francisco Chronicle, among others. Her award-winning poetry has been translated into Japanese, French, Spanish, Burmese and Farsi. Leza is a long-term member of SCBWI Japan.